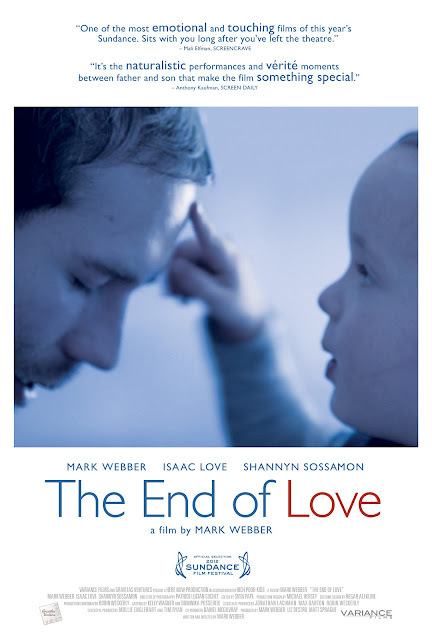 We had a chance to check out a press preview of The End of Love and we were blown away by the poignant plot and genuine rapport of Mark Webber and his toddler son. The fact that they have an actual father/son relationship and bond makes the characters realistic and the improvised dialogue natural in a way even a great script struggles to approach. It's intriguing to me that Mark pulled this off without a crew, generally in single takes. My husband's been in the film/TV industry for over 25 years as a location sound engineer, and I know what a behemoth behind the scenes production usually is! Mark is on to something vital and dynamic with his hybrid reality show/art film genre. The End of Love is a must see. This film has beautiful camera work and deals with matters of life and death, the intensity, fear and exhaustion of being responsible for another little life, and conversely the pure creativity and silly joy that spending 24/7 with a toddler can bring. It's tough to grieve and recover from the loss of a loved one, through death or even a break up, and far more so when you've got to mentally and physically keep it together for a child. This is a tribute to that struggle; a coming of age story and a family love story unlike any other I've seen. When the mother of his two-year-old son suddenly passes away, down-on-his-luck actor Mark (filmmaker Mark Webber) is forced to confront his shortcomings. He can no longer avoid his responsibilities, but he continues to cope with his reluctance to mature, struggling with the demands of being a single father. When he has a meaningful encounter with a young mother, Mark is no longer able to live in the comfort of denial, as this relationship offers not only a reprieve from loneliness, but a glimmer of hope for the future as well. The End of Love is an intimate and honest slice-of-life portrait of a father and son (played by Webber's real life son, Isaac) in transition. This semiautobiographical drama is an achingly honest portrait which tells a story about the universal pain of loss and the courage it takes to change. With Michael Cera, Amanda Seyfried and Aubrey Plaza. Directed by Mark Webber, U. S.A., 2012, 90 mins. "The threat [of economic collapse] is brought home by the extraordinary intimacy and tenderness with which The End Of Love captures the relationship between father and son"
"Exceptionally intimate... Told in a loose, surprisingly involving cinema verité style, the film is as successful depicting the smallest daily routines between parent and child...as it is at portraying life's more overwhelming moments"
"The End of Love excels at conveying the moment-to-moment frustrations and exhilarations of being a dad"
"The End of Love connects and lingers by making incredible effort seem natural"
When the mother of his two year old son Isaac suddenly passes away, struggling actor Mark (played by writer/director Mark Webber) is forced to grapple with his ability to grow up. As he kindles a relationship with a young single mother (Shannyn Sossamon, 40 Days and 40 Nights), he begins to realize that he can no longer remain in denial about the real life consequences his choices have on Isaac (played by Webber’s real life son to phenomenal affect). 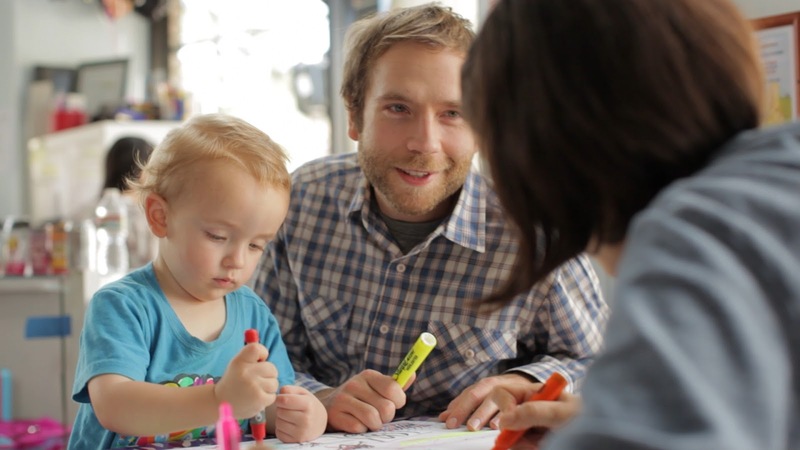 Set against the backdrop of Los Angeles, The End of Love is an intimate and stunningly honest portrait of a young father in transition between the life he’s been working for and the one that’s waiting for him. I starting writing The End of Love right after the relationship with my son's mother was coming to an end. My son was a year old at the time. My passion for making another film was reaching a fever point. I've always been obsessed with realism in film, and I knew my next project needed to explore that obsession. It hit me suddenly: why not take what I was going through in my life and use that to build a character and create an ultimate situation where I could live in character for the duration of the shoot. I never had a father growing up, and I myself at the time was a brand new dad. One night playing with my son, the story of The End of Love was born. I rehearsed with my cinematographer Patrice Cochet on how we could film the movie in a way that would not obstruct the real life moments happening. He came over and played with my son and me for a full month before we even got started. The filming was very experimental in nature. It is mostly shot in real time utilizing just single takes. he knew where to move the camera. In this day and age where millions of people are tuning into reality television, I hope audiences will connect with my cinematic version. In so many ways as an artist, my work is a reflection and reaction to what I'm experiencing in my life. I love leaving a film where I felt a connection with its characters, where I feel I have related somehow, and I believe The End of Love successfully blurs the line between reality and fiction in a way where the raw emotion is so easy to tap into. It's been a huge eye opening journey for me, and I hope you enjoy the film as much as I do.